Your carpets’ longevity depends on how clean you keep them. No matter how many times you vacuum the carpeted areas, time and constant traffic have their bad impact. Dust, stains and allergens pile up within the fibers every single day and only a professional carpet cleaning has the means to treat them. Whether you have decorative rugs or standard carpet strips in your hallways, this is a cleaning service ready to return back the bright colors and distinctive scent of the fabric. The key to successful carpet cleaning is experience and proper equipment. Carpets and rugs come in an impressive number of textiles, colors and fiber types, and every one of them demands a special treatment. That’s why our technicians will assess the material before the cleaning, to make sure the end result will have a maximum effect. Synthetic carpets are cleaned with powerful steam cleaning (hot water extraction) method. During the process, hot water solution under pressure is injected deep into the base of the carpet. It breaks down dirt particles, lifts stains and kills bacteria. At the end, the machine extracts the excess moisture to help your carpets dry out in a couple of hours. Of course, you can open a door or a window in the room to speed up the drying process. Your soft furniture has a crucial role in your home. It brings comfort and coziness, and improves the overall look of every room. Caring for your upholstery has to be a top priority in your home maintenance checklist. Simply vacuuming every once in awhile can’t achieve the deep clean effect one visit from a professional upholstery cleaning team can. So, take advantage of our efficient services, sanitize and preserve your sofas and armchairs. Our technicians operate with advanced cleaning machines and eco-friendly detergents. This guarantees a thorough clean, long lasting results and additional health benefits. Depending on the type of the upholstery you have, two main techniques can be used. For synthetic materials – a standard steam cleaning. It’s a powerful water treatment that removes even the toughest stains and oldest dirt. Natural fibers, however, get a gentle treatment with one goal in mind – preserve the textile. The dry cleaning method doesn’t use water solutions, but a special enzyme powder. It binds with all dirt and dust, making it easy to be extracted later with a powerful vacuum machine. 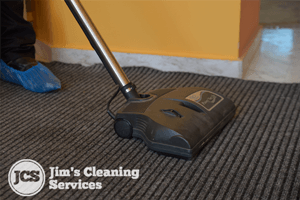 Jim's Cleaning Services Please thank your whole team for the hard work. They pulled a rather large project with my office over the weekend and the change was noticeable. You have earned yourself regular business with my company. Jim's Cleaning Services Your company was the first cleaning company I have ever tried, and I'm glad I did because you've been nothing but helpful every single time. My house is always so well-cleaned, it’s unbelievable. Jim's Cleaning Services My husband and I want to thank you from the bottom of our hearts for the last minute move in cleaning you provided. We hadn't planned well and were due to move into a new property ahead of schedule - your flexibility and fast response really saved us some real discomfort! Jim's Cleaning Services I have used your service for many hours to clean just about everything in my house and you have delivered time and time again! It’s really great to see companies which are dedicated to their customers. Keep up the good work. Jim's Cleaning Services The first time I ever had you over was to clean my carpets and you really impressed me. My carpets hadn't looked like this ever. I was really surprised and then used you again to help me with some window work. My windows stayed clean for months afterwards. Really professional! Jim's Cleaning Services Excellent work through and through. My barbecue has never looked cleaner and it took less than an afternoon, which to me seemed impossible to do. Thank you very much for the great service. © 2013 - 2019. Jim's Cleaning Services. All Rights Reserved.